When Drought Strikes, Should U.S. Policy Endanger Hungry People? The question answers itself. Of course not. But that is the effect of the Renewable Fuel Standard (RFS), more commonly known as the ethanol mandate. Under the RFS (Energy Independence and Security Act, p. 31), refiners must sell specified amounts of biofuel each year. The “volumetric targets” increase from 4.0 billion gallons in 2006 to 36 billion gallons in 2022. The amount of corn ethanol qualifying as “renewable” maxes out at 15 billion gallons in 2015. Already, ethanol production consumes about 40% of the annual U.S. corn crop. By 2022, 21 billion gallons are to be “advanced” (low-carbon) biofuels, of which 16 billion gallons are to be made from plant cellulose. But with cellulosic ethanol proving to be a complete dud, corn growners and ethanol producers are lobbying to redefine corn ethanol as “advanced.” If they succeed, mandatory sales of corn ethanol could significantly exceed 15 billion gallons annually. In any event, the RFS sets aside a large and increasing quantity of the U.S. corn crop each year for ethanol production regardless of market demand for competing uses — and heedless of the potential impacts on food prices and world hunger. 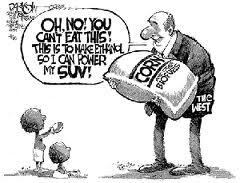 No matter how much of the U.S. corn crop is ruined by drought, no matter how high corn prices get, no matter how many people in developing countries are imperiled, the RFS requires that billions of bushels of corn be used to fuel cars rather than feed livestock and people. This is crazy. Corn futures hit their all-time high this week, exceeding $8.00 per bushel. Soybean prices are also at record levels. More than 1 billion of the world’s people live in absolute poverty (defined as an income of less than $1.25 per day). When prices for staple commodities soar, millions of people can be pushed to the brink of starvation. As noted yesterday on this blog, simply adding some flexibility to the RFS, so that the volumetric targets automatically scale back whenever corn reserves fall below critical thresholds, could help alleviate the surge in grain prices. Predictably, the corn lobby and USDA Secretary Tom Vilsack oppose this modest reform. Even if made more flexible, the RFS would still flout a bedrock principle of our constitutional system: equality under law. Why as a matter of law should ethanol producers get first dibs on the U.S. corn crop? Why should their interest legally trump that of every other industry and consumer affected by corn prices? Why should they have a legal privilege to jump to the front of the line ahead of meat, poultry, and dairy producers, or those who export grain to hunger-stricken countries? The ethanol lobby claims the RFS does not limit the availability of corn for other uses. The numbers indicate otherwise. As corn use for ethanol increased from 1.6 billion bushels in 2005/2006 to 5.0 billion in 2011/2012, use of corn for feed declined from 6.2 billion to an estimated 4.6 billion bushels, and corn exports declined from 2.1 billion to an estimated 1.7 billion bushels (FarmEcon LLC report, p. 19). The RFS turns a large and growing share of a major commodity into the exclusive preserve of one industry. This is not the American way. For a country that has traditionally fed those who were hungry with no thought of return, this is one of the worst policies that government has come up with. Flexibility leaves the mandate intact. The RFS must be eliminated, how many more billions do we have to take out of the economy (14 million household @ $100 increased food costs per month is $14 billion! ), and how many more billions of tax payer dollars need to keep propping this boondoggle up! If it is a viable source of fuel it will survive on its own! Eliminate the RFS now! btw Rep. Bob Goodlatte voted to start the RFS in 2005 when he was Chair of the Agriculture Committee.. that is why he wants flexibility, not elimination! The GOP and Dems have flexibly mounted up $16 Trillion in debt, and this is a good example of how it happens!